The Balfay crucifix and main altar. The traditional description of an Altar Society is a group of parish women who maintain the church's altar, altar linens and sanctuary. 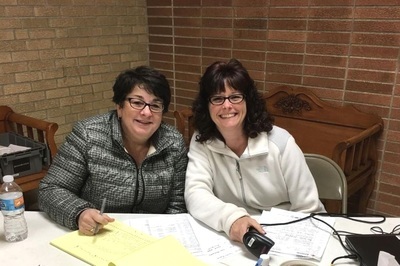 Over time, Altar Societies, have evolved into project teams who handle a great deal of the parish business. Church Cleaning which includes the sanctuary area and all three altars. Altars and floors are dusted and vacuumed. Communion rails are dusted and confession rooms, window sills, moldings and kneelers are dusted. Preparing and serving funeral dinners. This includes ordering food to accommodate the number of guests estimated by the family; and preparing deserts, salads and side dishes to go with purchased food. After the dinner the Altar Society does the basic cleanup and straightening of the parish hall. 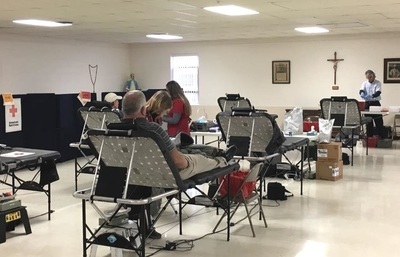 Assisting the American Red Cross with local blood drives. Planning, preparing and serving the Fall Festival meal. Also setting up the fancy stand and overseeing other groups who prepare games, tables, etc. This is a major project that involves most of the Altar Society members. Planning and supporting special events such as diocesan visits, special meetings, etc. 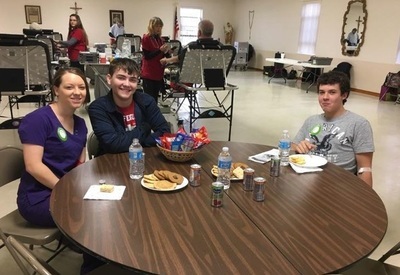 ​For large events, such as Fall Festival, the Altar Society often works with other parish organizations such and the Knights of Columbus and the Catholic Youth Ministry. Each of the monthly guilds is directed by a Guild President and Vice President. The Altar Society Letter is the plan for the organization's activity for the planning year. 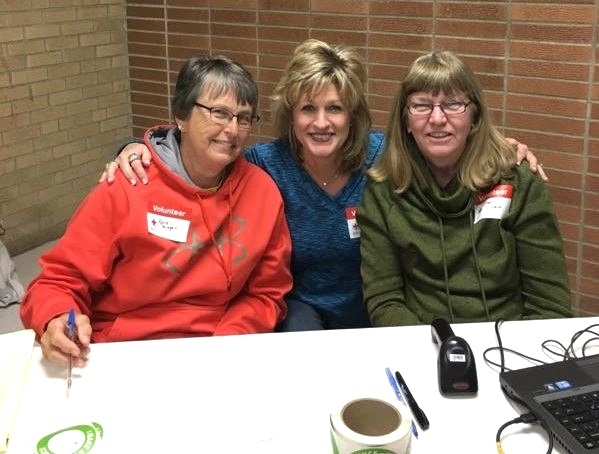 It includes: basic descriptions of society responsibilities and names and contact information for Altar Society board members, guild presidents and vice presidents and monthly guild members. Rosie, Marcia and Carol at the Front Desk. Red Cross Blood Collection Area. Proud of Our High School Students for Stepping Up! Alice and Tracie Checking Folks In. ​1. 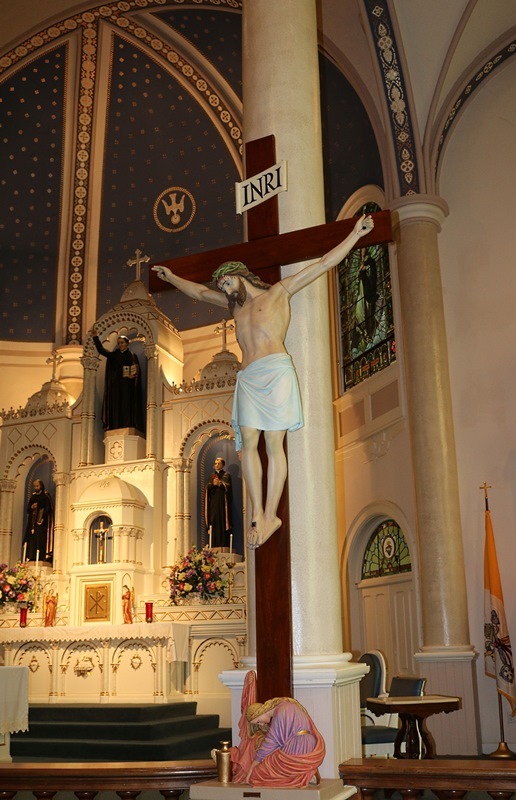 The life-sized crucifix was donated to the church by the family of Michael Balfay. When the Balfay family was moving from Chetopa to Osage Mission in 1884, their wagon was caught in river current at Trotters Ford. While trying to save his team and wagon Mr. Balfay promised that if our Lord spared his family he would make a lasting gift to the church. Michael's family was spared but before he could fulfill his promise he died suddenly. His family filled his promise in 1889. The three Jesuit saints in the altar niches are: St. Francis Hieronymo S.J. (top), St. Alphonsus Rodriguez S.J. (left) and St. John Berchmans (right).